Want to attract and retain productive staff? Looking to increase morale, productivity and profitabiity? We’re delighted to have the opportunity at this year’s Leicester Business Festival, to discuss the hottest buzzword in the business world these days – engagement. With surveys repeatedly showing that over 80 percent of employees are not engaged in their jobs, the scope for performance improvement is astonishing. We would therefore love you to join us – and think through how you can raise engagement levels in your organisation. The team at Chris Cooper Business Elevation, are running the event in conjunction with Engagement Multiplier, who are the initiators of a global movement and methodology, that enables businesses to simply measure and improve engagement levels in 90-days. 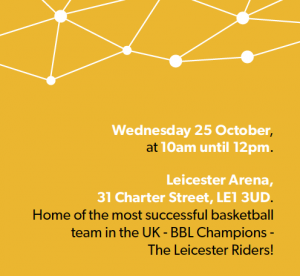 The event will also include some thoughts on engagement from the Chairman of the most successful basketball team in the UK – The Leicester Riders.